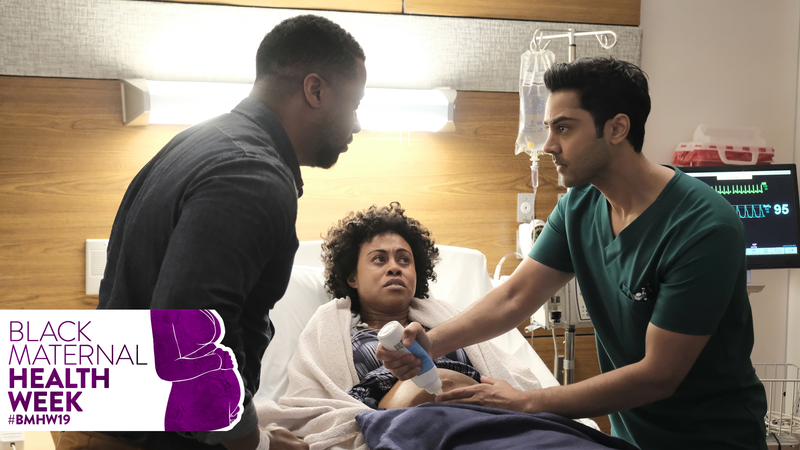 Manish Dayal as Devon Pravesh, Vinessa Atoine as Lea Jordan-Davies, Kamal Angelo Bolden as Wade Davies on the April 15 episode of ‘The Resident’ on Fox. “Lea Davies wasn’t a priority.” So said Dr. Devon Pravesh (Manish Dayal) on Monday night’s episode of The Resident, a fast-moving, gripping procedural drama on Fox starring The Good Wife’s Matt Czuchry, Malcolm Jamal Warner as Dr. AJ Austin, and Shaunette Renée Wilson as Dr. Mina Okafor. Monday’s episode, “If Not Now, When?” is dedicated to Kira Johnson, a young, accomplished, African-American woman who died in childbirth at Cedars-Sinai almost three years ago to the date. Charles Johnson, her widower, who has two young sons (ages 3 and 5), tirelessly advocates and amplifies the issue of maternal mortality through 4Kira4Moms, and worked extensively with The Resident’s writers to produce an authentic look at what might happen to a black woman giving birth in the United States today. The show got the harrowing statistics of black maternal mortality in through dialogue, and touched on much of what is wrong with the medical field today: from the arrogance of doctors, made quite obvious when an older, white male OB/GYN asks Indian-American resident, Dr. Pravesh, “How long have you been in this country?” to which Pravesh dryly replies, “I’m from New Jersey”; to overtaxed residents; hospitals being run as businesses; lax or no protocols around maternal health; and how unconscious bias can lead to the absolute worst results. Charles Johnson told The Root that Fox’s VP of Programming, Reena Singh, reached out to him last fall after he testified in support of H.R. 1318, the Preventing Maternal Deaths Act, signed into law by President Donald Trump on Dec. 16, 2018. He says that he was in Los Angeles meeting with writers about a week after that initial conversation. Johnson, who like many of us, didn’t know the extent of black women dying during childbirth, or up to a year after, sees the value in using popular culture to expose what he deems this country’s shame. “I am very much a private person. I don’t particularly like the spotlight. And just to be quite honest with you, I didn’t know if sharing our story was the right thing to do. But I knew I had to do something when I realized that we were smack in the middle of this maternal mortality crisis,” he said. Indeed. It’s a “secret” that shocks the system and exposes the very worst of what can happen when the stress of racism, sexism, and all the intersections of being a black woman in the United States collides with an American healthcare system that is inherently, dangerously biased against people who are not white, rich, heterosexual and male. “The United States is the most dangerous place in the developed world to give birth in. There’s no excuse for that,” notes Chief Resident Dr. Randolph Bell (Bruce Greenwood) to the hospital’s board by episode’s end. Of course, The Resident, being fictional, can “fix” or work towards fixing issues around maternal mortality and morbidity at Chastain, and set up a Review Board, as well as a new standard of care “to prevent all forms of bias, racial or otherwise,” he said. The real world, alas, moves a little slower, but the fact that women are out here dying, black women particularly, in what should be a routine procedure is, in a word, unacceptable. One of the main things that Charles Johnson advocates are protocols to be put in place around maternal care in all hospitals to ensure that every woman giving birth herself has the best chance at life. Johnson, who admitted that watching the show was at times difficult and somewhat surreal, is still happy with the result and by his amazing wife, who continues to touch lives. The Resident episode inspired by Kira Johnson airs tonight, Monday, April 15 on Fox at 8 p.m. ET/Central. There will be a “fireside chat” with Charles Johnson, members of the Black Mamas Matter Alliance (BMMA) and perhaps an actor or two immediately following the airing on 4Kira4Moms’s Facebook page and IG live.